Internationally, we draw upon a wide network of reliable, independent local attorneys and legal professionals. With their assistance, we have compiled various publications covering specific aspects of trademark practice and management. Provides practical details on licensing procedures, requirements and effectiveness in over 135 jurisdictions. Current status will be downloaded when you order the guide. This publication covers more than 250 jurisdictions all over the world. It answers the question whether International Registrations may be valid or not and provides a complete list of the correct Opposition Periods for International Registrations in all Contracting Parties. Essential information on trademark use requirements in more than 130 jurisdictions. Suitable for IP professionals (law firms and in-house counsel) who wish to keep abreast of the various requirements across countries. Trademark regulations and proceedings in 195 countries including multinational agreements like the Madrid Protocol and Agreement and the European Community. Useful overview on trademark regulations and proceedings in over 40 countries. Suitable for quick reference questions in your daily work. Regulations, proceedings and fees for trademark renewals in more than 140 jurisdictions. Essential for brand owners when commercializing their IP rights internationally. Trademark and background information on registering trademarks in more than 50 dependent territories, including parent countries. 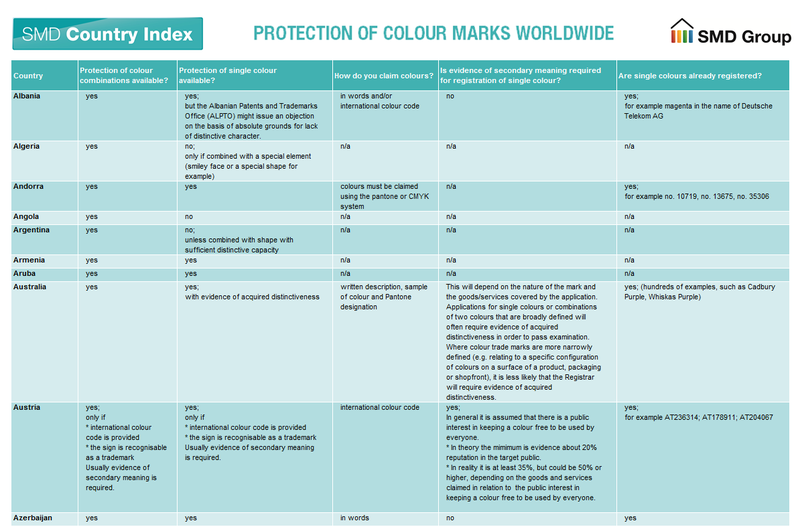 This publication provides an overview on the protection of colour marks through registration in 150 countries worldwide.